Handmade resin and silver tone metal, 1" in diameter. And take 20% off with Coupon Code HIYL20 from your entire order! Thank you SO much everyone who has posted. I really wish I could just send each of you a pendant. I have to always choose at random in the contests because it is impossible to choose only one. Please contact me at thehiylife@gmail.com with your mailing address and I will send you your pendant and necklace! I've decided that we're going to have a contest every week, and this week I'm going to be giving away two brand new pendants! Please check back here or I'll post a link to the Facebook page for the contest announcement. Thank you again so very much!! "Don't take life too seriously, no one gets out alive anyway!" Oh yes, great to keep in mind in rough moments! It's so difficult not to keep thinking about what might have been... but I know I have to live my life right now and I have a lot to be thankful for! I'm gonna make it through, I'm sure!! Thank you en keep posting your awesome and lovely quotes! "You've got to make the conscious choice every day to shed the old - whatever "the old" means for you". Yes definitely…love this. Carrying things around is very draining. I so love and agree with this! Thank you Amy!! Moving forward is not growing outward, but upward. Be strong the next step I will not be easy, but it will be next day of you're new tomorrow. 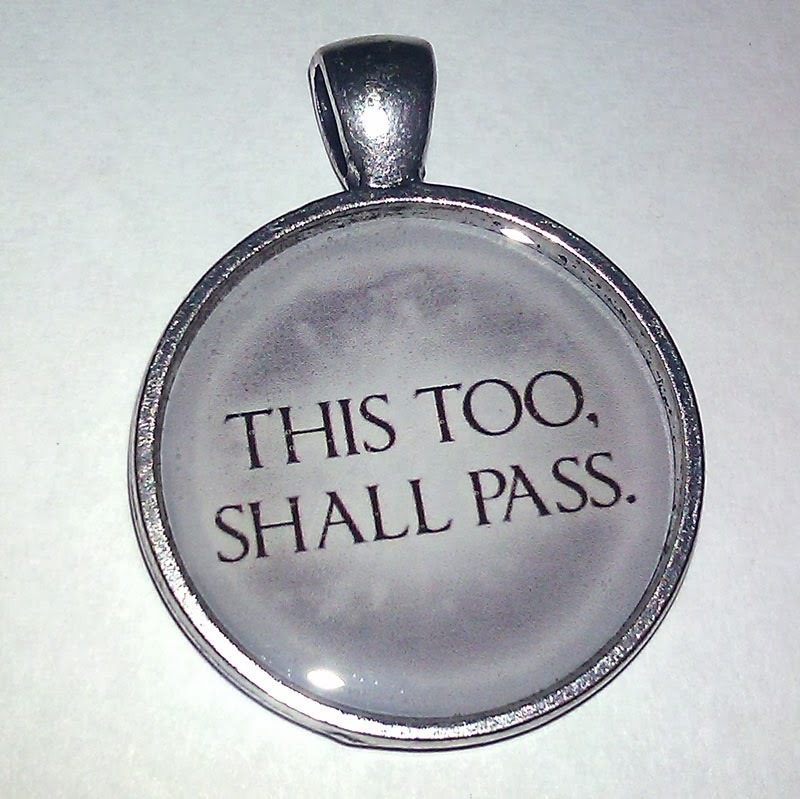 "This too, shall pass." It really is my favourite quote! Mine too Michele! It comes into play every day, doesn't it? Thanks Doe. You are such a sweetheart I must say. I would like to win this for my son-in-law. My daughter and son-in-law just lost their daughter, my granddaughter. Noelle Joy was only 5 1/2 months old. It was sudden. She was a very happy and healthy girl until she became sick and her fever spiked, she had seizures and due to the lack of oxygen to her brain, her brain became too swollen and she passed on 11/5/13. My son-in-law spoke at her funeral and told the story in which there was a ring with this saying on it. I think it would mean a lot to him as he loved his little girl so much and it would mean so much to him. Thank you. Oh Syria I cannot even imagine the pain you all are going through right now. I wish I knew the words to say to ease your pain, or could understand why some are taken so soon. Great love and strength to you. For every minute minute you are angry, you lose sixty seconds of happiness. Absolutely Mernie….this is such a good one to remind us of the value of time. Dear Brisja when is your surgery? Absolutely yes, a positive attitude is so essential! I will get through being falsely accused. This too shall pass. "Three things cannot remain long hidden; the sun, the moon, and the truth." ~ Buddha. "I'm beautifully broken, perfectly imperfect, beautiful in my flaws. All together, I am a beautiful disaster." Love this quote...sums me up perfectly!! Oh this one is good, Tory! It seems about acceptance, true 100% acceptance and love of one's self. Beautiful! Time heals almost everything, give the time, some time and smile, because you don't own all the problems in the world. This is great! It seems to be about surrender…doing your best and carrying on. We can never solve everything but it doesn't make sense then to be unhappy as long as everything is unsolved. Thank you. "Life is a balance of holding on amd letting go." Pretty pendant. A great reminder to just hang on too when things are stormy. Love once given, never forgotten!! "The only happiness in life, is to love and be loved." I agree..it seems to give meaning to life and when it's not felt, meaning seems to disappear. "Life is Hard, so the Love has to be Easy"-simply put when you are choosing a life partner, find someone who will be a shelter for you during life's storms. I did and I'm happy I chose wisely! YES! Excellent! Partners are supposed to lift each other up, not tear each other down or be indifferent. I'm very happy for you!! I LOVE this Hanne. I made a poster of it and had it as my profile photo on FB for months! Necklace is a perfect reminder that life is a battle but it is up to you to handle it with love and hope. Blessings.